OMAHA, Neb. (AP) — The diesel-burning locomotive, the workhorse of American railroads since World War II, will soon begin burning natural gas — a potentially historic shift that could cut fuel costs, reduce pollution and strengthen the advantage railroads hold over trucks in long-haul shipping. Rail companies want to take advantage of booming natural gas production that has cut the price of the fuel by as much as 50 percent. So they are preparing to experiment with redesigned engines capable of burning both diesel and liquefied natural gas. 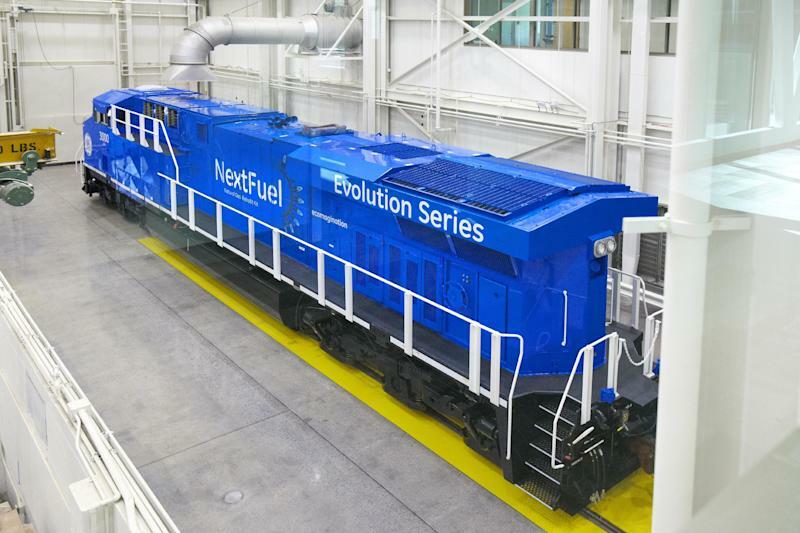 Natural gas "may revolutionize the industry much like the transition from steam to diesel," said Jessica Taylor, a spokeswoman for General Electric's locomotive division, one of several companies that will test new natural gas equipment later this year. Any changes are sure to happen slowly. A full-scale shift to natural gas would require expensive new infrastructure across the nation's 140,000-mile freight-rail system, including scores of fueling stations. The change has been made possible by hydraulic fracturing drilling techniques, which have allowed U.S. drillers to tap into vast deposits of natural gas. The boom has created such abundance that prices dropped to an average of $3.73 per million British thermal units last year — less than one-third of their 2008 peak. Over the past couple of years, cheap gas has inspired many utilities to turn away from coal, a move that hurt railroads' profits. And natural gas is becoming more widely used in transportation. More than 100,000 buses, trucks and other vehicles already run on it, although that figure represents only about 3 percent of the transportation sector. The savings could be considerable. 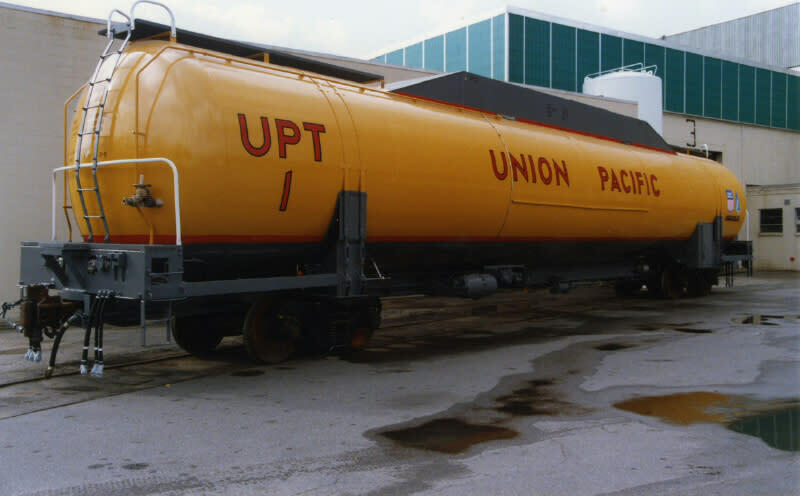 The nation's biggest freight railroad, Union Pacific, spent more than $3.6 billion on fuel in 2012, about a quarter of total expenses. But even under the most optimistic scenario, there's no way all of that diesel will be replaced. Railroads and locomotive makers are looking primarily at ways to retrofit existing machines to burn a mix of diesel and natural gas because that will be the quickest and easiest way to adopt the new technology. Locomotive makers have not yet set the prices of their retrofit kits, but railroads expect they will be cheaper than a new locomotive costing roughly $2 million. Using both diesel and natural gas also offers some advantages over using natural gas alone. The diesel can provide the spark needed to ignite natural gas without redesigning locomotive engines, and the diesel helps provide horsepower. Railroads are planning to use liquefied natural gas, which is not as readily available as other forms of gas because it must be cooled to minus 260 degrees. That step adds to the price, but the amount varies based on how the process is done. "It's so early in this that we're still working to understand the potential savings," said Louis Renjel, vice president of strategic infrastructure at CSX railroad. The projected cost comparisons do not include the millions of dollars railroads would have to spend on a network of natural gas fueling stations along their tracks. That expense won't be clear until after the tests, when railroads decide whether to build their own liquefaction facilities or just store fuels. "There are a lot of factors that aren't accounted for yet," said Michael Iden, who oversees locomotive engineering at Union Pacific. Locomotive makers say natural-gas engines could also significantly reduce emissions compared with diesel locomotives, but the potential cost savings is the biggest reason the rail industry is eager to make the change. From the outside, natural gas locomotives will not look much different, but they will have to pull a tank car behind the engine to carry enough liquefied natural gas, or LNG, to have a similar range to diesel units. 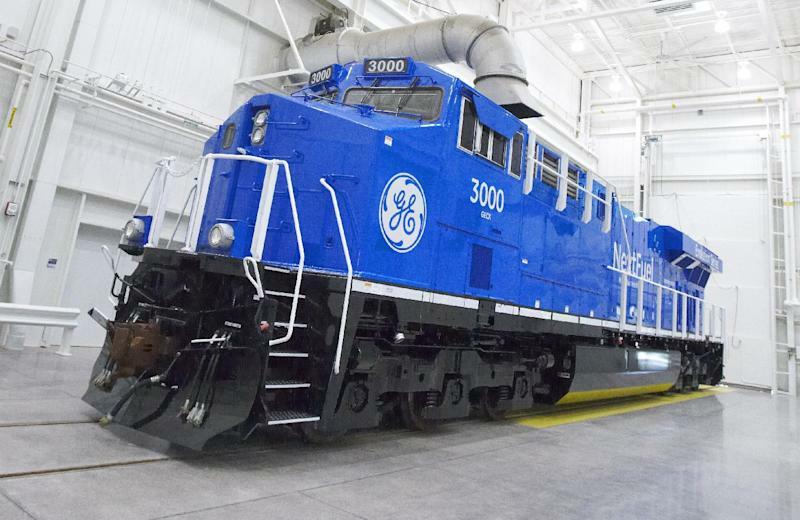 Both of the major locomotive manufacturers, General Electric and Caterpillar's Electro-Motive Diesel, have developed prototypes that will be tested by Union Pacific, CSX, BNSF and Canadian National railroads beginning this year. If the projected cost savings are realized, railroads would improve their profits and better compete against trucks, where they already hold the advantage on deliveries longer than 500 miles. "They can lower their costs further and widen their advantage over trucks," Edward Jones analyst Logan Purk said. But he sounded one note of caution: Natural gas prices have always been volatile, and they could climb if gas exports expand significantly and more industries switch over to natural gas. Another issue is the design for the fuel tender cars that will haul liquefied natural gas for the locomotives. That's something that will have to be standardized because the major freight railroads regularly pass locomotives back and forth to keep trains moving efficiently. Once they agree on a design for the tenders, the railroads may have a hard time getting enough of them because tank car manufactures are already struggling to keep up with demand. Customers sometimes wait up to three years for new tankers. This isn't the first time railroads have flirted with natural gas locomotives. Both Union Pacific and BNSF spent several years working on the concept in the late 1980s and 1990s, so the industry isn't starting from scratch. Industry officials say the rising natural gas prices that helped scuttle their earlier experimentation with the fuel should not pose a problem this time because significant new sources of natural gas are now available. Peter Roosen is CEO of VeRail, which is developing natural gas conversion kits for low-horsepower locomotives, such as those used in rail yards. "I think we're going to have reasonably priced natural gas for decades," Roosen said, "if not for a generation or two."